A cocktail for your skin? I am in love with The Body Shop's new range, Virgin Mojito. The company's new summer fragrance is gorgeous! The products smell exactly like a Mojito, and are so fresh and cleansing. I love mojitos - especially when they are made by my best friend's mum - they are delicious! If only you could smell through this screen, because I am terrible at describing smells and I am not selling the smell of this product enough - I think you just need to pop into the Body Shop at some point to have a little sniff. The collection has lots of amazing products, but I opted for the Body Sorbet. 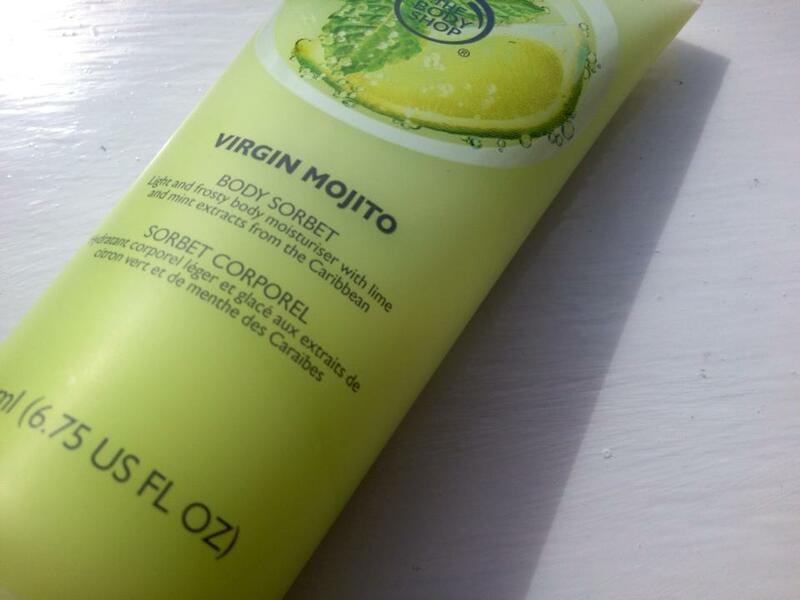 The Virgin Mojito Body Sorbet is a light, gel moisturiser with lime and mint extracts from the Caribbean. I love this body moisturiser as it is so hydrating and perfect for a summer body. The body sorbet also leaves my skin feeling smooth and soft, and the gorgeous aroma lasts for ages! I would definately recommend the whole range from The Body Shop, but especially the Body Sorbet. I have recently preferred non creamy moisturiser as they leave me feeling fresher and more clean.